Pros: The expressive choreography and the immersive orchestral score make this performance both epic and moving. Cons: One might quibble that it’s a little repetitive – but who said war is not monotonous? 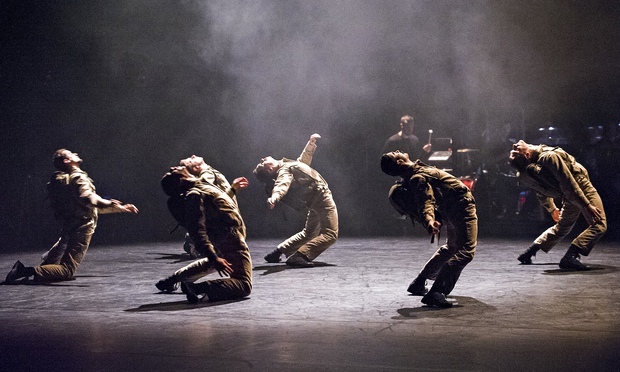 Choreography, light and music fuse together into a powerful performance in this portrayal of the mental and physical devastation of the Great War. Eleven young men are seemingly tossed about the stage as if by tumultuous waves, their movements governed by a higher force. They fall into each other’s arms, but whether they are wrestling or embracing is not clear. A man tackles all around him, and when there is no one left to fight, he collapses on the floor, his body shaking with grief. Choreographer Iván Pérez’s bleak but thrilling Young Men marks the centenary of the Great War in a tribute to the men and women who fought its battles. 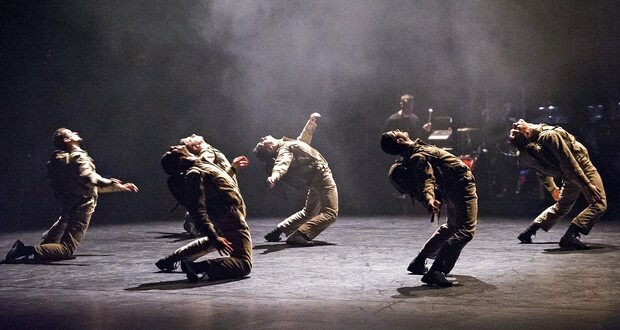 The eleven-strong BalletBoyz, with two female guest dancers, vividly portray the mental and physical struggles of the soldiers as they relentlessly succumb to the horrors of war. They are accompanied live by composer Keaton Henson’s spine-tingling orchestral score, which is almost cinematic in its unyielding intensity, as it envelops the whole of Sadler’s Wells auditorium in waves of forceful, nearly deafening and at times beautiful music. There is no doubt about the BalletBoyz’s talent: their bodies move in perfect unison, and they are masters in turning every step and movement into a powerful expression of the devastation, loneliness, camaraderie and resilience around them. In the parade ground drilling scene, movements are militarily precise, whereas on the battlefield, soldiers fall left, right and centre, getting up again and again only to be pushed down yet another time. Pérez also makes good use of the two female characters, inspired by true stories of women going to the front to fight and look for their brothers, lovers, and sons. In a particularly heart-breaking scene, one woman finds her husband, only to be wrenched away from him by the war. If this all sounds horribly depressing – well, it is a war-themed piece, and it is certainly a unsentimental and unflinching look at what the same young men who form the BalletBoyz group might well have been doing had they lived 100 years ago. It is also, however, very moving and beautiful, and choreography, lighting, and sound work together to create an epic and powerful work of art.